Now, this was more like what I expected when Mike Anderson was hired as the Arkansas Razorbacks’ basketball coach. What “this” am I praising? 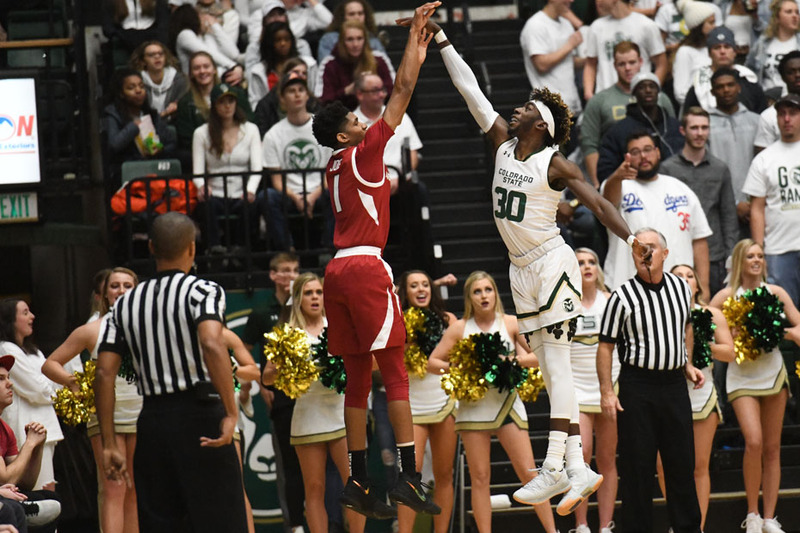 The Razorbacks’ late-night 98-74 thumping of Colorado State on the Rams’ home floor Wednesday night. The Hogs’ play reminded me so much of Nolan Richardson’s vintage Razorbacks squads from the late 1980s and early 1990s with their greediness on defense and their purposefulness on offense. As young and as inexperienced as this team may be, they understand how to play the game and realize if you execute properly on offense the game opens up for everyone. They also understand that the harder and the better they play defense, the more scoring opportunities they’ll receive and the easier those opportunities will be. It really was a thing of beauty to watch the team perform as a team, where every player washed each other’s hands in an effort to defeat the Rams in an aggressive yet efficient manner. And IT was a TEAM effort. It wasn’t Daniel Gafford and the Four Little Pigs as many assumed. Arkansas’ freshman- and newcomer-dominated squad doesn’t play like an inexperienced bunch. They play together, and that is so enjoyable to watch. Gafford scored only two points in the first half after sitting for an extended period because of fouls, but the Razorbacks hardly missed a beat with the 6-11 super sophomore on the bench. Arkansas’ bench went to work, outscoring the Rams, 22-2, for the remainder of the first half of a fast-paced game. Reggie Chaney scored 9 of his 11 points, and Keyshawn Embery-Simpson added eight of his 14. The Razorbacks looked like a well-oiled machine at both ends of the court, switching and baiting the Rams on defense and cutting and passing on offense with precision for the majority of the game. The Rams did carve out a double-digit run at the Razorbacks’ lead, but a quick timeout allowed Anderson to call a set play for Gafford that worked perfectly. The Hogs then cut off the Rams’ water defensively, and Arkansas never looked back. Mason Jones (16), Isaiah Joe (14), Gafford (12) and Adrio Bailey (10) joined Embery-Simpson and Chaney in double figures. However, the stat line of the game was Jalen Harris’. The sophomore transfer from New Mexico dished 12 assists and made 4 steals against just 3 turnovers, while adding 6 rebounds and 8 points. It would be hard for Anderson to order a better performance by a point guard in his system. Harris isn’t the only facilitator on the squad. The Razorbacks had 28 assists with Bailey, Gafford, Joe, and Jones each passing out three assists. Sharing the basketball like that, particularly with such a young team, is a sign of a squad with a high basketball I.Q. Coaches can and do teach their athletes to play smarter, but it is so much more of an advantage when players arrive on campus understanding the geometry and philosophy of the game. When a player gets the game mentally, he doesn’t lose it under stress. It’s instinctual. Instead of reverting to bad habits under pressure, he reverts to good ones. Anderson’s young players seem to have that quality. Jones, a sophomore, and Joe, a freshman, almost perfectly complement each other’s game on the wing. Jones is a slasher by nature, and Joe is a shooter. That’s what they do best, but it’s not the sum total of their game. Joe shoots well from mid range or long distance, and he drives to the basket well, too. Jones has a nice 3-point touch, which should only give him more opportunities to drive as defenders rush out to check him. Jones could be a bit more judicious in his shot selection at times, but then again, he’s the type of player who makes things happen. He has to have some freedom to create, and Anderson has wisely given it to him. They are guards that help out on the glass, which could make this one of the better team rebounding teams Anderson has had at Arkansas. Like Embery-Simpson and Chaney, Desi Sills makes positive things happen when he is on the floor. Sills had 8 points, 2 assists, and no turnovers in 16 minutes. He also provided solid defense on the perimeter when Arkansas’ starters are on the bench. Now, the Rams (4-5) aren’t a good basketball team, but the Razorbacks beat them handily on the road. To me that is promising. As well as they are playing with their 6-1 start, this Razorback team is still young and has a lot of room for improvement. They will face trials the rest of the pre-conference season, and will no doubt be tested by what is expected to be a very strong Southeastern Conference this year. What excites me is that Anderson has him some athletic basketball players not just athletes who play basketball no matter how young and inexperienced this team may be. The squad is quick, athletic, hungry and unselfish. That’s a good combination. The Razorbacks play host to Western Kentucky (4-4) at 2:30 p.m. Saturday in Bud Walton Arena in a game that will be televised by the SEC Network. The Hilltoppers lost 84-78 to Missouri State on Wednesday, and have also lost at Indiana State (63-54), to UCF (72-68), and to Washington (73-55). While Western Kentucky has struggled, the Hilltoppers did post a signature win over West Virginia, 63-57. The Mountaineers were ranked No. 13 in the Associated Press Poll at the time. The Razorbacks will take a week-long break for final exams following Saturday’s game. The Hogs will resume playing on Dec. 15 at Verizon Arena in Little Rock with a 7 p.m. game against Texas-San Antonio.